In addition, on Monday, July 24, there will be a March for Medicare for All in Washington, DC (and related marches across the country (closest to La Crosse is in Rockford, IL). You can view the DC event at their website. So, maybe on Monday everyone in the Third CD could do a PHONE March for Medicare for All by pledging to call Rep. Ron Kind's office (DC: (202) 225-5506 or La Crosse: (608) 782-2558) in solidarity with the real marches and tell him to join the 115 co-sponsors of HR 676 (including fellow Dem reps Mark Pocan, Gwen Moore, and Keith Ellison, among 112 others) ASAP because that's what most people want and need. See below for talking points. 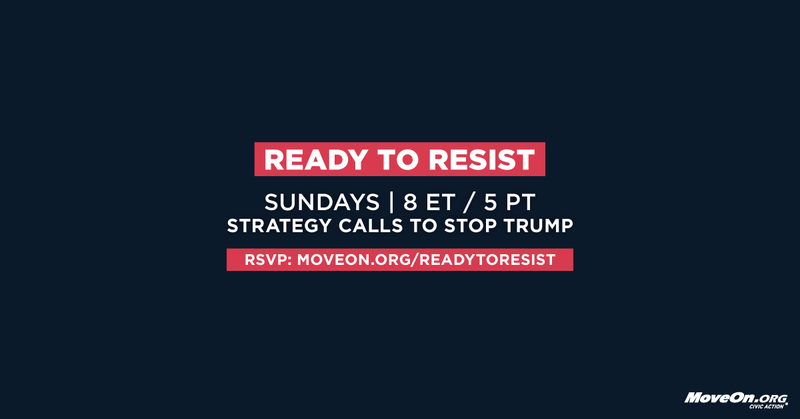 Ready to Resist mass movement call, this Sunday, July 23 at 7 p.m. Central Time for some #RealTalk on Trumpcare—including our successes in stopping it so far and how the next few days may unfold—and to prepare for the upcoming August congressional recess. Ben Wikler, Washington director for MoveOn, will join us for the third installment of his lively updates on the health care fight from the nation's capitol as we head into a crucial, possibly make-or-break week. Rusty Williams is a fourth-generation, lifelong resident of West Virginia and a leader with West Virginia Citizen Action. When he was diagnosed with cancer in 2012 and left without insurance, Rusty became active in advocating for patients' rights. Trump is headed to West Virginia Monday in a last-ditch effort to persuade Senator Shelley Moore Capito to support his disastrous health care plan, which would cripple the Medicaid program that 30% of West Virginians count on for health care. Rusty will share the story of how West Virginians have effectively organized to stop Sen. Capito from taking away their health care. Mari Cordes, Marcia Dinkins, and Biola Jeje will lead a short training on how to hold members of Congress accountable for their votes during the upcoming monthlong August congressional recess. Mari Cordes has been a registered nurse for 30 years and is the former local union president of Vermont Federation of Nurses and Health Professionals and a founding board member of Rights and Democracy Vermont. Marcia Dinkins is the executive director of the Mahoning Valley Organizing Collaborative in Youngstown, Ohio. Biola Jeje is National Organizer with Resist Here, a project of the Working Families Organization. Jennifer Epps-Addison, President and Co-Executive Director of the Center for Popular Democracy, will host the conversation. Because we've continually raised our voices together, 181 days into the Trump administration, we've protected our health care and changed the conversation to continue pressing for Medicare for All. Click here to RSVP for the call, and we'll dial you in this Sunday at 7 p.m. CT. The job of single-payer proponents now, Dr. Paris emphasized, is to make it politically damaging for Democrats who refuse to listen to their constituents and instead remain committed to a failed for-profit system, under which millions remain uninsured. There is no Republican plan that won't result in millions of people - from children to veterans - in losing health care coverage. For more general talking points about why a single payer health plan is better than other options, visit the Physicians for a National Health Program FAQ page.